The Lion’s Club Student of the Month for January is Sterling Benko, a young man who exemplifies the commitment that students at Vermilion High School have made to making our school, community and world better. Sterling has worked as a volunteer for many sporting events. both in the concession stand and in other jobs where he might be needed. He was instrumental in setting up the first annual “Crushin’ it on the Coast” charity volleyball game between Huron and Vermilion to help raise money for cancer research and a deserving family. He has been a long-time volunteer for youth basketball and baseball camps for the past several summers. Besides time spent outside of school helping others, Sterling is a dedicated and hardworking athlete. He has been a member of the three-time Sandusky Bay Conference Champion Boys Basketball team and two-time SBC championship baseball team. He was voted 1st team All Lorain County Catcher and 1st team All Sandusky Bay Conference catcher. He also is an active member of the Academic Challenge team, Peer Leadership, Teen Leadership Corp and Big Buddies group. He was selected to be a representative to Buckeye Boys State, where he was elected Director of Public Safety. Adding to all of his activities and volunteer efforts is the fact that he carries a 4.010 GPA with a schedule full of honor and college level classes, which ranks him 9th in his class. Sterling’s teachers and coaches would all say he is a bright, outgoing young man, who is also a hard-working leader for other students and players. Congratulations to Sterling and his parents, Mary and Mark Benko. Maggie Hoffman is the November honoree for Lions Student of the Month. Maggie carries on a proud tradition of high standards, great character, and superb academic achievement. She is currently ranked in the top 1/3 of her class with a 3.6 GPA. She has been awarded the All-Academic Award in Cross Country for Lorain County and first team All-Academic Sandusky Bay Conference. She serves as a representative member of the Ohio High School Athletic Association Leadership Conference. In school Maggie is an active member of National Honor Society, Link Crew, Peer Leadership, Move2Stand, Leo Club and Model UN. Besides being an academic star, Maggie has been ranked as one of the top athletes at Vermilion High School over the past several years. She has earned multiple letters in Softball, first team Sandusky Bay Conference pitcher, second team All-Lorain County pitcher, was Vermilion’s representative in the end of year All-Star Game, and holds the new record for RBI’s earned in a season. Maggie also participates in cross country, girls basketball, track and a summer traveling softball team. Outside of school, Maggie volunteers at Grace’s Kitchen, PSO babysitting at St. Mary’s, and serves as a holiday elf for the Jeremy Cares Organization, which helps serious ill children struggling with disease. Other volunteer service hours were earned as a model for the Vermilion Professional Businesswomen fundraiser, Mill Manor and Kingston nursing homes, and as a camp counselor at Camp Intervention. When asked what her teachers would say about her, she quickly answered “involved and hardworking”. Mr. D’Egidio said that this young lady is a model of consistency and effort, and is conscientious about her school work and grades. This young lady is truly a leader by example in the classroom, on the athletic field, and in society. Maggie is the daughter of Lisa and Steve Hoffman. October Student of the Month is Hannah Schuetz, the daughter of Diane and Kurt Schuetz. Hannah is very active in clubs and organizations both in school and out of school. As a member of the class of 2019, she ranks 11th and has earned a 3.971 grade point average. She takes a number of college level classes and easily excels in them. Hannah was awarded an Academic Letter and was chosen as Student of the Year in both Science and Art. She has been recognized as a Scholastic Art Honorable Mention and is a Cleveland Clinic Expressions art program participant. She is also involved in the Cuyahoga County Medical Examiners Shadow program. Besides her high academic achievements, Hannah excels as a member of the National Honor Society (2 years), Move 2 Stand (5 years), Leo Club (5 years), and Student Council (4 years). She also is involved and active in Art Club and the Principal’s Advisory Council. Outside of school Hannah is an active member of Teen Life at Saint Mary’s Church and serves as a volunteer at Grace’s Kitchen, Mill Manor and Kingston Nursing Home. She has also been a participant in the National Catholic Youth Conference and St. Mary’s Church Christmas plays. As one who has seen her in action, Mr. D’Egidio would say that Hannah is a rare person in today’s world in that she is true to herself, her beliefs and values. Her smile is infectious and her personality can light up a room. Other teachers commented that Hannah is an asset to their class and is a consistent model for other students. She is a rare combination of confidence and humility. In a world where many people do things because they want to be seen, she does them because they are the right things to do. 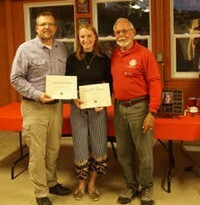 Lions Club Student of the Month for September is Rachel Frisky, daughter of Carrie and Michael Frisky. Rachel is a young lady who sets the bar high for herself. Academically, Rachel is taking a full load of college level classes and has earned a strong 3.64 GPA. She is considerate and conscientious about her assignments and is diligent about her work effort. Last school year she was recognized as Science department student of the month at VHS. She is a positive presence in class and makes the room better for being in it. Outside of the classroom Rachel is the current vice -president of Leo Club and participates in both the Speech and Debate and the Academic Challenge teams. She is a member of the Sailor Marching Band as a section leader and has been captain of the flag corps for two years. A three year letter winner for the track team, Rachel was voted “most improved” last season, demonstrating how hard she works to make herself the best she can be. She also participates in Winter Guard, Ski Club, and is a member of National Honor Society. Rachel is active in community service projects and is willing to give her free time to help others in the community. She has worked events for Leo Club and the Vermilion Fire Department, such as Cookies with Santa and Salvation Army bell-ringing. According to Mr. D’Egidio and several other teachers, Rachel is a hard worker who is always willing to challenge and improve herself. She works hard and is conscientious both in and out of the classroom. Congratulations to this very deserving Leo Club honoree. Savana Powers, Leo Club Student of the Month for May, finishes off a tremendous year of great talents and volunteerism. Savana maintains a 3.557 GPA and ranks in the top 20 percent of her class. She has completed several AP classes and is not afraid to challenge herself academically. For three straight years she earned honorable mention on the National Spanish Exam for her knowledge of Spanish language and grammar. Savana has also been published in a national book of poetry titled Accomplished, sponsored by The American Library of Poetry in 2016. At VHS Savana is active in wind ensemble and the Sailor marching band, where she earned four Varsity letters. She is also member of Leo Club, and works on the stage crew for the annual musical. When she is not producing literary works or showing her musical ability, Savana spends time working and volunteering. She is involved in the various community service events sponsored by Leo Club, and actively donates her time to various organizations such as Goodwill. As her teachers will attest, Savana regards herself as a quiet leader who is dedicated to her studies. Both Mrs. Judd and Mr. Klein agree she is a quiet leader who is hardworking and understands the value of giving back to her community. She is a person whom Vermilion High School and the Vermilion community can be proud to call one of their own. Savana’s parents are Trina and Keith Powers. April’s Student of the Month is another in a long line of Vermilion students who have set high standards for themselves and have gone on to exceed those standards. As an athlete, Ethan Habermehl has been a three sport star, participating in football, basketball and track. He also spent a season on the golf team. He has overcome illness and injuries, demonstrating that he has what it takes to be a distinguished individual in athletics and in his personal life. Ethan earned three varsity letters in basketball, two in football and one in track and field. He is a leader whose passion for success is evident in the hard work he displays, how he motivates others and encourages teammates. As a student, Ethan sports a 3.17 GPA and has been accepted into several colleges. He is a diligent student, with a gift for art. His work has been featured in a number of ways in district and other area Art festivals. Outside of VHS, Ethan’s work has been acknowledged received Silver Key award in the Scholastic Art Competition at LCCC 5 different times and has been entered into numerous other competitions. His work will be on display at the Fine Art Fair at VHS on May 17. Ethan serves the community at VHS in Peer Leadership, Link Crew and Move2Stand. He is a member of the Big Buddies program, which matches high school students with middle school and elementary students for mentoring opportunities. Outside of school, Ethan’s philanthropy continues as he has worked with Habitat for Humanity and with SPARK (Students Preventing Abuse and Raising Knowledge), which works to combat drug and alcohol abuse among young people. His teacher and coach Mr. D’Egidio would say that Ethan is one of the hardest working young men he has encountered and that he is always willing to learn how to improve and get better. His other teachers and coaches would echo those words calling Ethan passionate and hard working. Ethan is the son of proud parents Jean and Christopher Habermehl. The March Lion’s Club Student of the Month is Nicole Peter, a young girl who has definitely left her mark on Vermilion High School. Nicole ranks fourth in the class with a 4.422 GPA. She is enrolled in multiple college level classes at VHS and excels in all of them. Nicole has been named Department Student of the Year in English, Spanish, Social Studies and Science. She was awarded the Bronze Medal on the National Spanish Exam and has been named a National Merit Commended Scholar. She earned an Academic Letter and a Lamp of Learning Award. At VHS, Nicole is a member of the Academic Challenge Team, National Honor Society and Band, where she holds trombone first chair in concert band and was the section leader for marching band. She is a leader in Move-2-Stand, is head of Dance Committee for Student Council, and leads the community service section for Leo Club. Outside of school Nicole volunteers at the Bird Loft, is an active member of St. Mary’s Parish, and works for Roose and Ressler, LPA. She also serves as a member the drug prevention group SPARK (Students Preventing Abuse and Raising Knowledge). Congratulations to Nicole Peter, pictured here with her parents Erika and Steve Peter, and Lion's Club member Kellie Lunn.